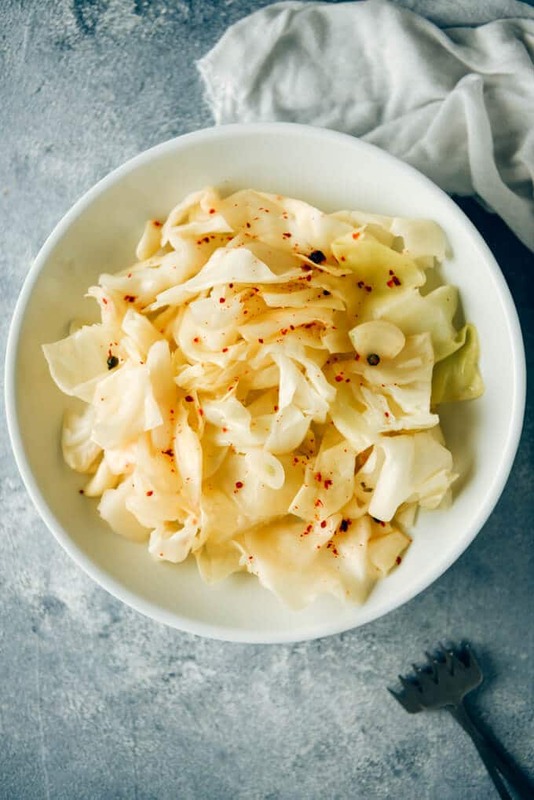 This Quick Pickled Cabbage is crunchy, tangy, sweet and spiced up with a little hot chili flakes. Ready to eat on the same day. This post was originally published in 2011 and we are updating it today with additional information. Do you like pickles as a side dish or in your burgers? Have you ever tried making it at home? Without waiting for weeks. I know an easy way and want to share it with you too. 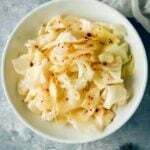 If you want to take your burgers, sandwiches or even side dishes like Coleslaw Without Mayo to a new level, go ahead and make this quick pickled cabbage recipe. It is super easy to make and you can enjoy it on the same day. How to Make Quick Pickled Cabbage? This is another dish from my childhood. 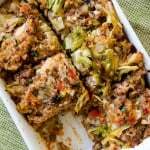 Mom would never waste leftover cabbage whenever she made stuffed cabbage rolls. You know the thick parts of cabbage we remove when making rolls. I don’t know if this is something created by mom or all moms make it in the same way. But I’m sure you will love it. Of course no need to make cabbage rolls first to make this pickled cabbage. You can just make it from a whole cabbage too. Pickling couldn’t have been easier. Put vinegar, lemon juice, water, salt and peppercorn in a pot. Bring it to boil. Chop white or red cabbage roughly and put it in the pot. Add in garlic cloves and red pepper flakes. Remove from the heat so that the chopped cabbage won’t get too tender. Let it sit at least 30 minutes. Cool completely before serving or using it in sandwiches. We like it in sandwiches like Feta Cheese Sandwich with Herbs. Although we mostly use quick pickled onion in this sandwich recipe because it is even easier, sometimes cabbage makes a good twist too. Using it in a healthy chicken salad for a tangy condiment is another great idea. You can use Joanne’s Crockpot Chicken Breast on Fifteen Spatulas when making a salad that is rich in protein. It would be perfect in a salad with taco seasoned beef and fresh vegetables as well. Don’t worry if you don’t know how to make it. Go check the amazing Taco Salad with Creamy Taco Dressing on A Farmgirl’s Dabbles and use this cabbage in it. Pickled cabbage in the easiest form. Ready on the same day! Chop the cabbage roughly. Makes 3-4 cups. Put water, lemon juice, vinegar, salt and sugar in a pot. Bring to boil. Put the chopped cabbage, garlic, red pepper flakes and black peppercorn into this boiling water. Give it a good stir and remove from heat. Cool completely and chill at least for an hour before using. Keep the leftovers in a jar or in an airtight container in the fridge. Chilling is not included in the duration. I have been trying to find this recipe for the longest. My Turkish friend brings her mommas cooking to me all the time and well this is pretty much the steps she told and the ingredients.